Things have been heating up in Bend and the summer tourist season seems to be in full swing. Last weekend, I decided to head up to Wickiup Reservoir to get away from the crowds and cool down with a swim behind one of the larger human-made structures on the Deschutes. As we mentioned in our last article, there are dozens of dams in the Deschutes River Basin, ranging in size from 5-feet to 440-feet tall. The main dam on the Deschutes River forms Wickiup Reservoir which provides water storage to meet irrigation demands throughout the summer. With this series of articles, we have set out to discover what makes the Deschutes River tick, and we’ve landed at the crux of the issue. While Central Oregon’s geology and climate certainly play major roles in determining the character of the Deschutes River, it would be hard to argue that the single biggest factor controlling the behavior of our beloved river isn’t the human-controlled operation of dams and other structures. Consider this. Even if we went an entire year without rain or snow in the Deschutes River Basin, you would see little change to the historical flow regime in the Deschutes River because of the overarching flow regulation provided by the system of dams in the basin. 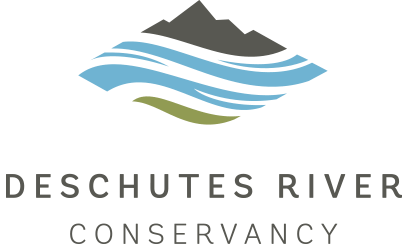 Put another way, by impounding and storing water in massive quantities at various spots along the Deschutes we have functionally disconnected the river from short-term impacts of climate within its watershed. I find this to be completely mind-blowing, and the situation is not unique to the Deschutes. There are over 80,000 dams in the United States, 8,100 of which are considered to be ‘major dams’, or dams that are at least 50 feet tall or store at least 25,000 acre-feet of water (Lake Simtustus on the Deschutes River has a storage capacity of 33,190 acre-feet). With these marvels of human ingenuity and engineering, we have wrested control of our nation’s rivers from Mother Nature and taken it into our own hands. This installment in our series is somewhat of a primer. In the next few articles, I will explore different aspects of how dams facilitate our survival in the desert of Central Oregon, as well as the ways that these massive structures stress and threaten the natural ecosystems we treasure. I’m wading in contentious waters here, but I’m going to try my best to present objective facts over opinions. Upfront, I want to state that society could not exist in the American West without the presence of dams and other infrastructure which allows humans to move and store water to meet their agricultural, urban, and industrial needs. However, it is undeniable that this infrastructure has had devastating impacts on the natural system it exists within. How do we strike a balance? What is the right balance? Ask 10 people and it is likely you will get 10 different answers. This makes policy questions around managing freshwater systems extremely complex. We all owe our thanks to the DRC for tackling these tough questions head-on with groundbreaking strategies that meet the needs of a huge variety of interest groups. Hopefully after we explore this topic in the coming weeks we will all have a deeper appreciation for how difficult and important this work is. *For an exhaustive history on how (and why) the waters of the American West were tamed, I recommend checking out the book Cadillac Desert by Marc Reisner. I seriously can’t recommend this book highly enough. It requires no background in environmental science to be able to appreciate, though I’ve had it assigned in several graduate-level courses on water policy. Anyone interested in U.S. history will find it hard to put down.